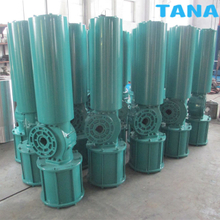 AW pneumatic actuator is divided into double-acting and single acting (spring reset), two divided cylinder, easy to manufacture large size block, large output torque, flexible motion smoothly; Cylinder wall and piston shaft hard chrome plating, have very good abrasion resistance; All sliding parts with oil free between shaft and guide ring to reduce friction coefficient, prolong service life, u-shaped curve characteristics of AW pneumatic actuator output torque is more suitable for large diameter ball valve, butterfly valve. 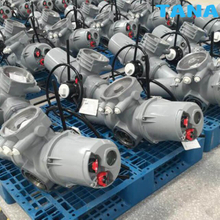 AT single acting( spring return) pneumatic actuator and double action pneumatic actuator are available for ball valves, butterfly valves,and plug valves. Rotate Angle:90 degree(120 or 180 are also available). Life Time:more than million times. 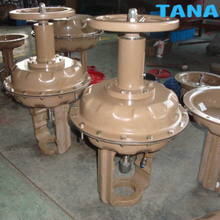 Pneumatic diaphragm actuator mechanism is the linear actuators mounted in the final adjustment components,equipped with multiple built-in springs,And the overall structure is compact,and the thrust is huge,It is particularly applicable to straight travel control valve.butterfly valve and damper regulator and so on of each series. It applied in waste water treatment plants,power plants,refineries,mining and nuclear processes,and pipelines. 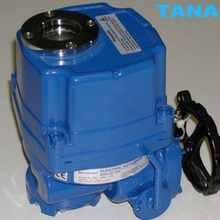 TANA extensive range of linear pneumatic and hydraulic actuators are designed to operate sliding stem valves of all sizes and manufacture.Our proven design and engineering expertise has developed a product suitable for the harshest of environments. 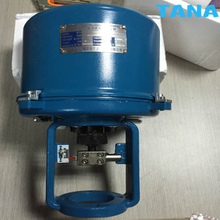 ODL series electric actuator is used for controlling valves of 0°-90°-270° rotation and other similar products, such as butterfly valve, ball valve, damper, flapper valves, plug valves, louver valve and so on. It is widely used in petroleum, chemical, water treatment, shipping, paper making, power plants, heating, light industry and other industries. It can be driven by 380V/220V/110V AC power or 24V/110V DC power. Control signal can be 4-20mA current signal or 0-10V voltage signal. 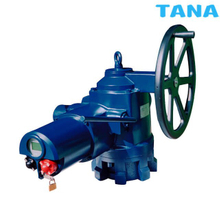 It can move the valve to desired position, and achieves automatic control. The maximum output torque is up to 2000N·m. (CE certificate approved). The 3810 L series Linear Motion Electric Actuator for Control Valve is driven by the 200 single phase alternating current power supply. 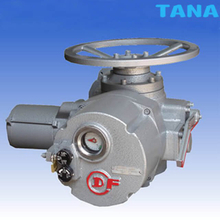 Receiving the control signal (DC4~ 20mA or DC1~5V) from the regulator, it can not only provide almost all kinds of the transforming function that the valve itself requires but also valve's open degree signal function and manual function. So it is widely used in the industry sectors such as metallurgy, petrochemistry, light industry and environmental protection. 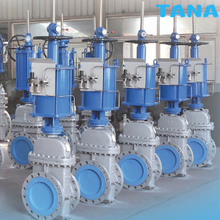 Greatork Intelligent Multi-turn Electric Actuator AVA01~ AVA10 can actuate control valves, such as globe valves, gate valves, sluice valves, penstock,pinch valve,dampers/shut valve,etc. AVA01 ~ AVA10 combined with BA bevel gearbox with Max toruqe of 850,000Nm. 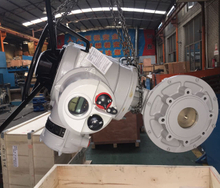 AVA01~ AVA10 combined with ZJ worm gearbox for large torque ball valves, butterfly valves and dampers,can reach Max toruqe of 110,000Nm Multi-turn Actuator AVA01~ AVA10 torque range is from 45Nm to 2500Nm (35ft-lbf to 1843ft-lbf). For higher torque, they shall combined with BA bevel gearbox or ZJ worm gearbox. Voltage Supply:110Vac ~ 660Vac, 50Hz/60Hz, single or three phase. Enclosure Protection: IP68, Double-seated structure. IsolationClass F, Class H (optional) Output Speed: 18/21rpm ~ 96/115rpm, Optional Function: Modulating I/O signal 4 - 20mA (AVAM01 ~ AVAM06) Explosion Proof,water tight(IP68) Fieldbus System: Modbus, Profibus, etc. 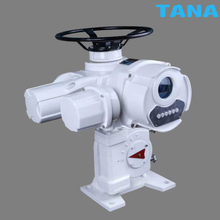 Integrated normal type and integrated explosion type multi-turn electric valve actuators consist of ZB5~ZB40,ZC45~250 and ZB5B~ZB40B, ZC45B~ZC250B electric valve actuators and additional electric control elements. 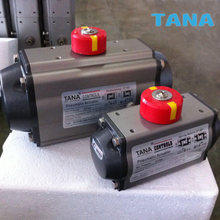 And ZC350~ZC1000BZ actuators are combined with ZC180~250BZ actuators and additional gear reducers. With control module and big capacity contactors built in, these series electric valve actuators need no more electric control box. And so they are small in size and of complete functions (provided withautomatic correction of phase sequence, protection of phase-lacking automatic correction of phase sequence, protection of phase-lacking, four modes of remote control, and the function of emergent valve shut in addition), simple in installation and wiring (once the 3-phase power supply is connected, can local operation be carried out), easy to maintain and repair (electric circuit is controlled by DC 24V voltage, electric elements are connected one another with plugs and sockets). 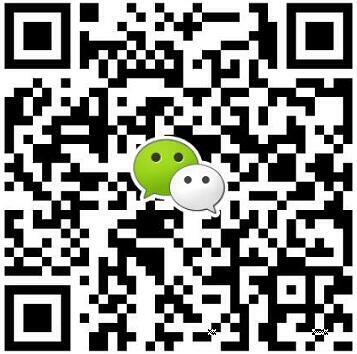 CHANGZHOU-SCHNEIDER (abr. as SND) non-intrusive intellectualized electric modulating actuators are products of new generation developed by cooperation on the basis of introducing the newest control technology from Schneider.These mechanic-electronic products have been integrated advanced multi-control technologies such as absolute coding technology, sensor technology, bus-mastering technology, infrared remote control technology, LED, magnetic control switch and advanced manufacturing technology.SND Range products are units to control the operation of final control element (e.g.valves) in open control system. Among the rest, SND actuators of Range Z are used for the control of globe valve, gate valve, throttle valve, water gate and etc. 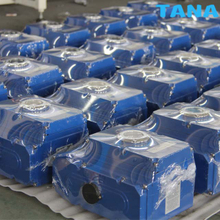 And SND actuators of Range Q and DQ are used for the control of ball valve, butterfly valve, and damper etc. A new generation of intelligent IK3 series electric actuators are suitable for the linear operation valves or angular travel valves, which are the essential drives for opening closing or adjusting valves, and also have remote-control, centralized-control or self-control device on valves. The product has multi-function stable performance advanced control system, small size, light weight, easy maintenance and simple operation etc advantages. Meanwhile, it can be non-intrusive set and examined by infrared remote control. Actuators use LCD displays, showing work state by figures and can be debugged without opening the covers,which offers great convenience for the users to operate. 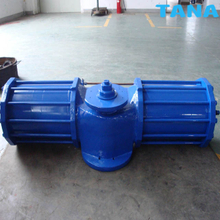 The actuator has automatic protection and flameproof function, which is popular and widely applied in the oil, chemicals, electric power, metallurgy, recycled paper, water treatment and other industries. All IQ actuators are set up non-intrusively using a Rotork setting tool.Torque levels,position limits,control and indication functions can all be accessed using the intrinsically safe,wireless handheld setting tool.IQ multi-turn 3-phase electric actuators designed for isolation or regulation duties(S2&S3/class A&B) of up to 60 starts per hour.Direct torque output range from 34 Nm(25 lbf.ft)to 3000Nm(2200 lbf.ft) with the addition of second stage gearboxes,multi-turn output torque up to 43,000 Nm(31,715 lbf.ft) and quarter turn up to 1,000,000 Nm737,561 lbf.ft)are availble. Wenzhou Topnotch Machine Co.,Ltd is a professional leader China Valve Actuators,electric valve actuator,pneumatic actuator valve,pneumatic ball valve,valves and actuators,Rotary ELectric Actuator,Intelligent Electric Actuator,electric actuator,Quarter-turn electric actuator,Multi-turn electric actuator manufacturers and suppliers with high quality and low price.Welcome to contact us!